Jermain Defoe has signed a permanent four-and-a-half-year contract with Portsmouth and was never on loan at Fratton Park, reports BBC Radio Solent. The 25-year-old England striker moved to Pompey from Tottenham on transfer deadline day. There was confusion over the terms of the transfer, with Portsmouth initially announcing Defoe had joined on loan. But Pompey's chief executive Peter Storrie says that the deal was always a permanent one. Storrie's claims are contrary to those of a Portsmouth spokesman, who said on Sunday: "Defoe's transfer was done as an initial loan because of time restraints. "The full documents will be signed and registered this week and this is a standard method when you have little time." 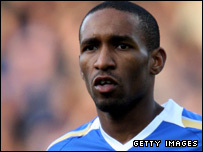 Defoe scored on his Portsmouth debut in Saturday's 1-1 draw against Chelsea. Pompey boss Harry Redknapp bought Defoe at the same time as he sold Zimbabwe striker Benjani, who finally joined Manchester City for an initial £3.87m on Tuesday. There had been more confusion over that move, with Benjani left in limbo for five days after his move to City ran out of time on Thursday night. Benjani's transfer went through on Tuesday when the Premier League completed their investigation into why forms from City to register Benjani did not arrive in time to beat the January transfer deadline.